Mr. Adkisson was a graduate of the Warsaw High School, Warsaw, Illinois. Following high school he served in the U.S. Navy from 1966 - 1969 serving on a USS Destroyer. He received his Bachelors Degree from Western Illinois University. Art began his teaching career in Colusa, Illinois and finished his 33 year career at the Nauvoo-Colusa Elementary School. When Art wasn’t teaching he enjoyed helping local carpenters. Mr. Adkisson was a member of the Nauvoo American Legion where he served as an adjutant and was a charter member of the Nauvoo Jaycees. 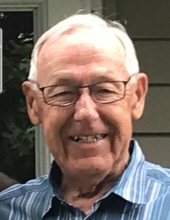 A memorial service will be held at 10:00 a.m. Tuesday, April 16, 2019 at Schmitz-Banks & Beals Funeral Home in Nauvoo with Pastor Mark Anderson and Fr. Tony Trosley officiating. Burial with Military Rites will follow in the Oakwood Cemetery, Hamilton, Illinois. Friends may call after 1:00 p.m. Monday, April 15 at Schmitz-Banks & Beals where the family will receive friends from 4:00 until 7:00 p.m. A memorial fund has been established for the Nauvoo Veterans Memorial or the donor’s choice. Please visit Art’s obituary at sbbfuneralhome.com to leave a conndolence. To plant a tree in memory of Arthur R. Adkisson, please visit our Tribute Store. "Email Address" would like to share the life celebration of Arthur R. Adkisson. Click on the "link" to go to share a favorite memory or leave a condolence message for the family.